Enter Code "FreeGround" at checkout for Free Ground Shipping on orders of $150 or more. 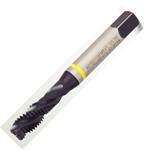 Designed for high speed tapping applications. Developed to withstand the high stress and high heat associated with high-speed CNC production tapping. Features a unique free-cutting design with a special tempering and geometry which contributes to extra tool life. Superior performance in hardened tool steels such as 4140, 4340, H13, D2 up to 35 HRC. 1-1/2-6, 4 flute, H6, Sowa Yellow Ring Spiral Flute Tap. 6-3/8" OAL, 1.667" Thread Length. 2.5 pitch lead - bottoming. Click on "more info" for details.